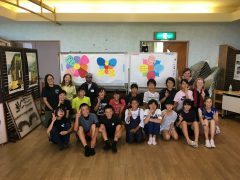 As a part of our goals to spread information internationally and train global staff who can communicate and facilitate exchange with foreign countries, the Oki Islands UNESCO Global Geopark Promotion Committee conducts English camp in order to increase the interest in English and ability to communicate in English of local children. This year the Middle School English camp (8/16-17;1 night, 2 days) and High School English camp (8/18-19; 1 night, 2 days) was held at Oki Shizenmura (Oki Nature Village) on Nakanoshima Island (Ama Town). 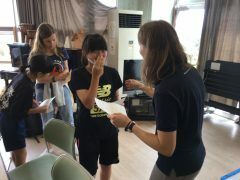 This year marks the third Middle School English Camp, with 15 students participating, and the fourth High School English Camp, with 4 students participating. On the first day of the Middle School English Camp, after a round of creative and active icebreakers, in a change from the original schedule, which was adapted due to poor weather, the students began to work on their creative activity. In the creative activity, groups came up with the best three foods, places, and activities on Oki. On the second day, the weather improved, and we went to the Akiya Coast, where staff introduced sightseeing spots and natural and geological features. On the first day of the High School English Camp, after icebreakers, students went to Kinkōji Temple and the Akiya Coast, where they learned about the popular sightseeing spots and historical, natural, and geological features of the area. On the second day of camp, using the information gathered on the previous day at Kinkōji Temple and on the Akiya Coast, students created and presented a plan for an Oki Islands Geopark Souvenir. The Icebreakers, guiding at Kinkōji Temple and the Akiya Coast, and creative activity presentations were all carried out in English. At times this was difficult, but all the participants seemed to enjoy the activities and tried their best to communicate in English. We would like to thank all of the Coordinators for International Relations (CIRs), Assistant Language Teachers (ALTs), and Teachers who helped out in the English Camp during this busy time. 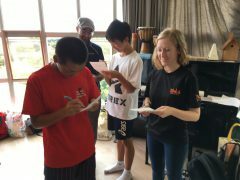 Thanks to everyone’s help we were able to hold successful camps and the participants were able to enjoy learning about Oki in English. This year’s camps really turned out great! To all participants: we plan on holding English camps next year as well. We hope to organize even better camps next year, so please apply if interested!